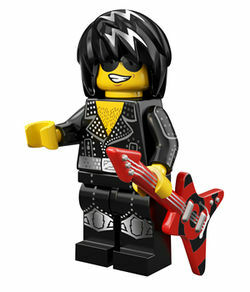 The Rock Star is a collectable minifigure released in 2014 as a part of Series 12. This is a description taken from LEGO.com. Please do not modify it. (visit this item's product page) "They call it a rock because it rocks, baby!" This page was last edited on 3 July 2017, at 14:57.